This carburetor has become very popular with NASCAR and other touring series sanctioning bodies. The purpose is to restrict the power by restricting the airflow into the engine. The initial results seemed to produce the desired significant reduction in power with the added benefits of leveling the playing field of performance. BUT WE WENT TO WORK AND CHANGED ALL THAT! Whenever a carburetor is sized improperly to the engine (like this one), there are a variety of problems that arise. The air/fuel circuitry was designed for a low air speed/horsepower application. When this design is applied to a high air speed situation it produces a rich, poorly emulsified fuel mixture. VDL Fuel Systems has done extensive dyno and track testing to recalibrate the air/fuel circuitry, accelerator pump circuitry, and idle circuit, producing optimum torque, horsepower, and drivability. Airflow is of the essence with a restricted carburetor. VDL Fuel Systems takes every part of this carburetor and maximizes the potential airflow while still operating within the tech parameters. That is where it gets very tricky. For whatever reasons, the tech tools have evolved to allow a significant amount of modifications beyond the stock sizing. From booster dimensions, booster location, and throttle shaft width to venturi height, this carburetor must be custom fit to the tech tools. The performance gains from these modifications are in the 25 horsepower range! Obviously not something you can afford to leave on the table. The other difficult aspect to the dimensional aspect of this carburetor is that each series’ tech seems to vary just a bit, requiring VDL Fuel Systems to build a specific carburetor to each series application! Now what do you think of your “out of the box” carburetor? After the parts are machined to the minimum/maximum sizing, they are vibratory polished and re-coated. Assembly is done to tolerance unobtainable in high volume production. Boosters are installed to within .001’’ on height, twist, and pitch. The base plate is matched to the main body. All gaskets are properly matched to the main body to prevent overhang. And finally, the throttle plates are adjusted for optimum position on the flow bench. VDL Fuel Systems produces the absolute best custom-built 390 CFM carburetor available! It is the most labor-intensive carburetor we build, requiring attention to every detail of its machining and assembly so that each dimension is maximize to your tech parameters. To get the best results, we will need to fully understand your engine combination and the track or series where you will compete with your VDL, so give us a call! Float Level – The fuel level in the bowls should be set about 1/8″ below the sight hole so that you have to jostle the car heavily to get the fuel to come out the sight hole when running. We set the floats in the shop to a particular setting; but fuel pressure dictates fuel level. Therefore you must set this when you first install the carburetor. 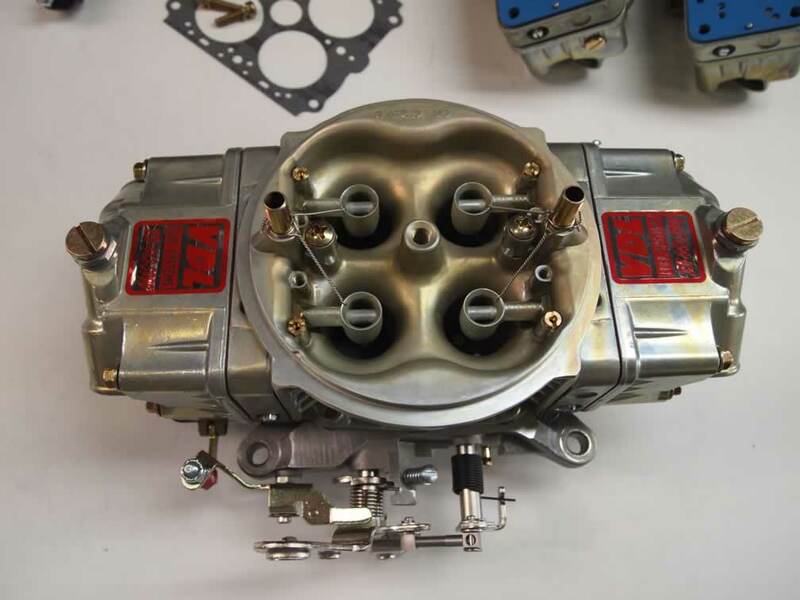 If the floats are set too high the carburetor will be too rich at low rpm and/or part throttle conditions. You will particularly notice this when coming off the corners. It should be noted that at a no-load situation, such as in the pits setting the timing, the carburetor will always have a slight rich condition at probably 3000 rpm. This is due to the fact that the strong booster signal and the fuel metering that enables us to make good torque numbers is pulling a lot of fuel in at this rpm/vacuum. At the same time there is no way to burn the fuel because there is no load, and the engine will flutter. Finally, after setting the floats, always give the carburetor time to burn off enough fuel to reopen the needle/seat so that your new setting is really what you are seeing. Many times people lower the float too much because they haven’t waited a sufficient amount of time for the fuel to burn off and the new setting to take. Throttle Blade Adjustment – The throttle blades should be set at an rpm that is as low as possible to keep from pulling through the high speed circuit/the boosters at idle. Special attention should be taken to ensure that the primary and the secondary throttle blades are always adjusted as low as possible, with the primary never being more than 1/2 round open. If you should lose your settings just back them both completely off, put 1/2 round in the primary and do not adjust this again. Put 1/2 round in the secondary, and start there. Idle Mixture Screws – Always adjust the 4 idle mixture screws evenly. The settings on all 4 should be the same. Our original setting is 1 1/2 turns out. If for some reason your engine absolutely needs a different setting on one side or one corner you can just about bet something is wrong with the engine causing it to have a different signal/vacuum on that side/corner. Pump Circuit Tuning – Because of the differences in track conditions and driving styles you may need to adjust the pump circuit, i.e. pump cam/pump arm, to correct “off corner” stumbling issues. If an engine stumbles two or three times after the driver steps into the throttle this usually indicates too much fuel and can be corrected by adjusting slack in the pump arm or installing a smaller pump cam. We recommend adjusting the secondary first to the point of even removing the secondary pump cam thereby disabling the secondary pump squirter. If an engine has a “dead hesitation” and then picks right up and goes, this usually indicates not enough fuel on the pump circuit. First check that both pump arms have no slack in the adjustment then proceed to increase pump shot with either a larger pump cam or a larger pump nozzle. This adjustment should be done on the primary side first.